This class + membership = $320! For those who have had some experience drawing the figure, this workshop will introduce you to expressive drawing techniques. Each week will focus on different ways to bring your drawing to life using charcoal, ink, mixed-media drawing, acrylics, and collage. Come loosen up and play using the model as a starting point, and then take your work to varying levels of abstraction. Slide shows of contemporary and historical artists will be presented to provide inspiration for new directions in your figurative artwork. Bring your own materials. Easels, masonite boards with clips and newsprint are provided. Canadian-born, Cape Cod based artist Jackie Reeves uses mixed media to bring together figurative and abstract elements in her art. She was raised in Montreal by architect parents and studied design art at Concordia University. Her artistic career began as a professional mural painter for corporate, private and public spaces. Concurrently, Reeves co founded the Plymouth Community Art Center. 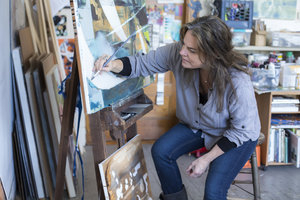 In 2010 she earned her MFA in painting at Massachusetts College of Art and Design and has since exhibited in solo and group shows throughout Cape Cod and in Pennsylvania, Vermont, Washington DC and North Carolina. She has been profiled in numerous publications including the Boston Globe, Art New England, Artscope Magazine. She is the 2016 recipient of the Arts Foundation of Cape Cod's Fellowship award for Visual Arts and was selected by them to paint the 32nd annual Boston Pops by the Sea commemorative painting in 2017. A resident of the United States since 1995, Reeves currently lives in Sandwich, Massachusetts. On Center Gallery, Provincetown, MA.